Please read the following disclaimer before using the database for the first time. 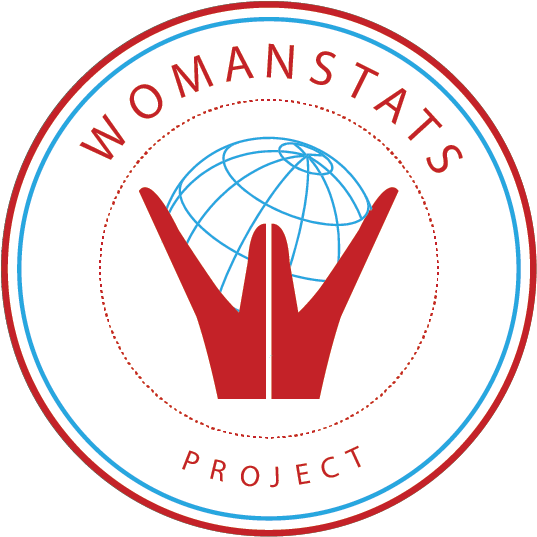 The WomanStats Project compiles data about women from many sources, including inter-governmental organizations, non-governmental organizations, governmental agencies, scholarly articles and books, news reports, and interviews with country experts. We ask that if you use the WomanStats Database to find information, that you credit that assistance. We also ask that you use our Database for non-profit, non-proprietary purposes. 1) We only compile data and information from reputable sources. Nevertheless, WomanStats cannot vouch for the accuracy of the data compiled, or the validity of opinions expressed in the data; we can only vouch for the accuracy of our compilation of the information from extant, credentialed, reputable sources. 2) Data we collect from one source may contradict data we collect from another source. We are not in a position to adjudicate which source is more accurate, and we provide all relevant information so that the user may see the range of information given by various credentialed sources and thereby come to their own conclusions. 3) There may be regional, ethnic, or religious variations in the status of women within a particular country that are not captured adequately at the level of national data. We do compile subnational data whenever that is available. 4) Live links are provided in the bibliography for each data point that is available. Over time, those links may become broken/dead. In your own reference to such a data point, use the access date we have provided, for the link was live at that date. 5) Because certain reports, such as the CEDAW reports, may be found uploaded to the internet in several places, there may be variations in page numbers between what we have cited in the database and the page numbers to be found in particular versions of reports; generally, these will not vary by more than one or two pages. 6) When our system is complete, each entry will note whether the information provided has been proofread by a project supervisor or not. If an entry has not been proofread yet, it is possible there may be typographical or other errors in the entry. We believe that approximately 3% of our bibliographic citations are incomplete or have some citation errors; if you notice any of these problematic citations (or any other errors, such as when nonsense symbols appear, or when there are duplicate entries of data, or typos), we would be grateful to be alerted so that we may rectify the problem. 7) We have not collected information for states with less than 200,000 population. 8) Palestine is listed separately from Israel in the database. 9) Data for Cyprus is predominantly for the internationally recognized state of Cyprus; information for non-recognized Turkish Cyprus, where available, is treated as a region of Cyprus. 10) Data for more recently recognized countries, such as South Sudan, will be much more sparse than for long-recognized states. 11) If you would like to contribute data or make tax-deductible donations, either would be most welcome! Please click here. To view the data, you first need to create a free account by clicking here. To return to the database, click here. If you have forgotten your login information, click here.